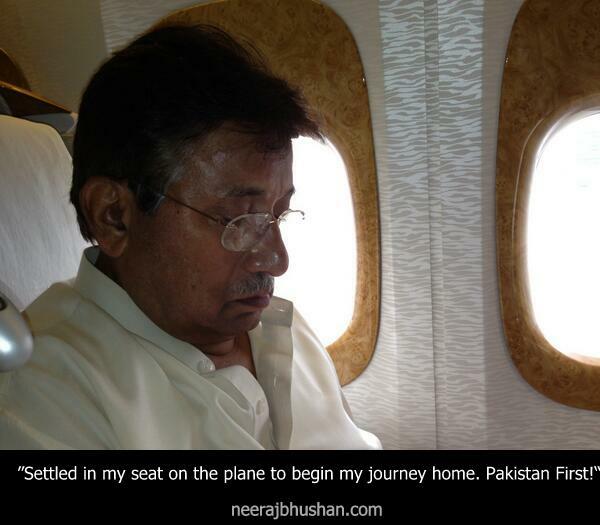 He tweeted this picture of himself aboard the plane to his country, months after announcing to end his self-exile during which he wandered in London and Saudi Arabia. 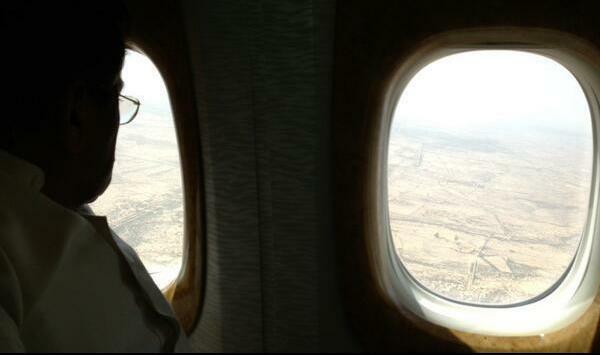 Does he look confident in this photograph splashed through his mobile while leaving Dubai? What do you think about the death threats this former president and military leader carriy in Pakistan? An already politically unstable Pakistan is heading for elections in May and this might have forced (read allured) Musharraf to head for his country where the Taliban has announced to kill him. Incidentally, it was during Musharraf’s dictatorship that both of his political rivals Benazir Bhutto and Nawaz Sharif returned to Pakistan. And they too returned after exiles. Coincidentally, both of them even feared for their safety. Also, both of them returned from Saudi Arabia only. Musharraf however could not protect Benazir as she was quickly killed before her people after an election rally. Is it a coincidence that it’s Benazir Bhutto’s husband Asif Ali Zardari who is now President of Pakistan. Will he guarantee safety to Musharraf whose role in Benazir’s killing could not be ruled out. In Dubai, before the plane took off, some people gathered to chant “Long live Pervez Musharraf”. But will he? Human Rights Watch has already demanded that the Pakistani government should hold the former military ruler Musharraf accountable for abuses when he returns to Pakistan. Pakistan has never seen long peace. It’s destiny with military and terror is also well written on every wall that smacks of power. This time Pakistanis must put an end to the military’s impunity for abuses. No matter if India still held talks with Musharraf in Agra despite he being the architect of the unnecessary Kargil War. Legal proceedings are pending against Musharraf in several human rights cases. In November 2011, Musharraf was charged with involvement in the killing of Akbar Bugti, a Baloch nationalist leader who died under unclear circumstances while hiding in a cave in August 2006, after a long standoff with the Pakistani military. In February 2011, Musharraf was declared an absconder after a court in Rawalpindi accepted the interim charge-sheet from Pakistan’s Federal Investigation Agency, which named the former president as one of the accused in the Benazir’s assassination. Musharraf has also been charged with the illegal removal from office and confinement of much of the country’s judiciary, including the serving chief justice of the Supreme Court, from November 2007 to March 2008. Musharraf has the distinction of having suspended constitutional rule twice during his time in office. After declaring a state of emergency in November 2007, he began a violent crackdown and ordered the detention of some 10,000 political opponents –including most of the country’s Supreme Court judges. The fired chief justice, Iftikhar Mohammad Chaudhry, five other judges, and several leading lawyers remained under house arrest and were released only when the opposition Pakistan Peoples’ Party formed a government and took over the prime minister’s office in March 2008. Musharraf in Mecca two days before heading to Pakistan. Pakistan’s elected parliament has though rolled back most of Musharraf’s unlawful decrees and reversed virtually all his self-empowering constitutional measures. However, there has been little progress in holding accountable Musharraf and others in his government responsible for egregious human rights abuses including killings, torture, and enforced disappearances. Musharraf seized power in a 1999 military coup and ruled Pakistan until his ouster in 2008. During his time in power Musharraf exiled opposition leaders, including Benazir and former prime minister Nawaz Sharif. When Sharif tried to return to Pakistan in September 2007, Musharraf forcibly exiled him back to Saudi Arabia in violation of international law and Pakistan’s constitution and in defiance of a direct ruling by Pakistan’s Supreme Court. However, Bhutto successfully returned in October 2007 and Sharif in November in the run up to elections. Thereafter, Musharraf was forced to resign in the wake of Benazir’s assassination in December 2007 and subsequent elections that brought her Pakistan People’s Party to power. Since fleeing Pakistan in 2008, Musharraf has formed his own political party, the All Pakistan Muslim League, considered electorally and politically marginal by most independent analysts. Next 10 years of my PTI struggle – can it rain for ever!